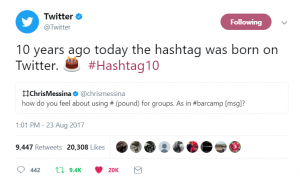 A week ago today, it was 10 years to the day that the first hashtag was born. Since then, the hashtag is still going strong and has been used countless times across all social media platforms. 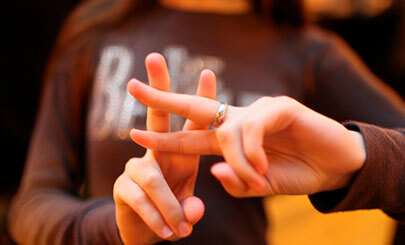 The hashtag, or better know has #, was originally created for Twitter to group items and tweets together. For example, if you clicked on #FollowFriday, then you will see all other tweets and conversations using that hashtag. Hashtags are an easy way for people to find specific conversations and for businesses to reach a wider audience. It created more engagement on Twitter and is now used across other platforms such as Instagram and Facebook. It was such a success that even big companies include hashtags in their social media campaigns! it may be tempting, but using too many hashtags can be damaging and decrease engagement. On platforms like Twitter and Facebook, one or two is great, but more than that and engagement actually decreases by over 10%. On instagram there is a bit more leeway. You will probably find people hashtagging like crazy and getting loads of engagement, but like Twitter and Facebook you shouldn’t overdo it. Stick to around 10 and you are good to go. there is nothing worse than clicking on a hashtag and then seeing a bunch of irrelevant tweets! If your hashtag doesn’t match the content of your tweet, then it isn’t going to look very good. It looks like spam and people will have a poor perception of you on social media. So, remember to make sure you are using the right hashtag for your content. Much like the last point, you need to make sure that the hashtag is not only relevant to the content, but it also should fit with your brand’s image. It can be tempting to look on trending hashtags and use them. This is great but if the hashtag doesn’t fit your image, then don’t use it just to use it. It can look awkward and out of place. Your followers could be turned off by a sudden change of message. If you have a digital marketing campaign that engages directly with audiences then creating your own hashtag is a good idea. Competitions, events or specific campaigns are great for unique hashtags. Plus using your own hashtag can help encourage engagement from your audience. If you are going to use your own, make sure it is catchy and also do a search to make sure that it hasn’t been used before. Try not to make it too long or overcomplicated and keep it consistent across all social media platforms.